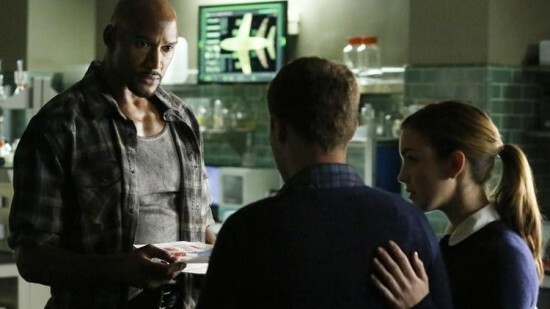 Mack is concerned about Fitz, and “Simmons” convinces Fitz to tell Mack about his plan to try and destabilize Creel. Fitz tells Mack that he didn’t solve this “today”. Mack figures out that Fitz means he came up with the design before he lost his memory. Mack is able to find the design on an iPad. Creel was damaged by the 084, and has a spot on his arm that he cannot heal or change to a new material. He tells this to his HYDRA contact, who promises Creel that he will be fixed once they make the drop. Reina surprises Creel, and offers him some carbide (rare carbon found in stardust, and is 3 times harder than a diamond) in exchange for the 084. Creel rejects her offer and takes the carbide anyway. Reina has slipped a tracker onto Creel, and passes the information along to Coulson. Reina is no longer working for HYDRA, or so she says. After everything that happened, Coulson still wants Hunter to return to S.H.I.E.L.D. The ranks are thin, and Coulson needs all the help he can get. Coulson can’t totally trust him, but Hunter has pissed off May, so Coulson figures she’ll keep him in check. Coulson meet with General Talbot, trying once again to strike up a working agreement. S.H.I.E.L.D. will supply the military with all the bad guys, and Talbot will keep rising the ranks. Talbot declines, and Coulson shows off the two cloaked jets that they have in their possession. Skye confides in May that she thinks something is wrong with Coulson. May, of course, tells Skye that Coulson is fine. May then talks to Coulson about how it’s been 18 days since his last episode. Coulson can’t hold it in, and starts drawing symbols or code of some sort on the wall. Most likely the symbols he was trying to get Skye to decipher. They looked like they could be vaguely alien. Reina has the 084 and is talking with a mystery man. He tells her to pick up the 084. Reina does, and some lights go off, but it does not hurt her. She thinks it worked, but the man just tells her that it let her live. Reina wants to see him use it, but he says he only will if she brings him his daughter. So it looks like we’re beginning the “who are Skye’s parents” arc finally.